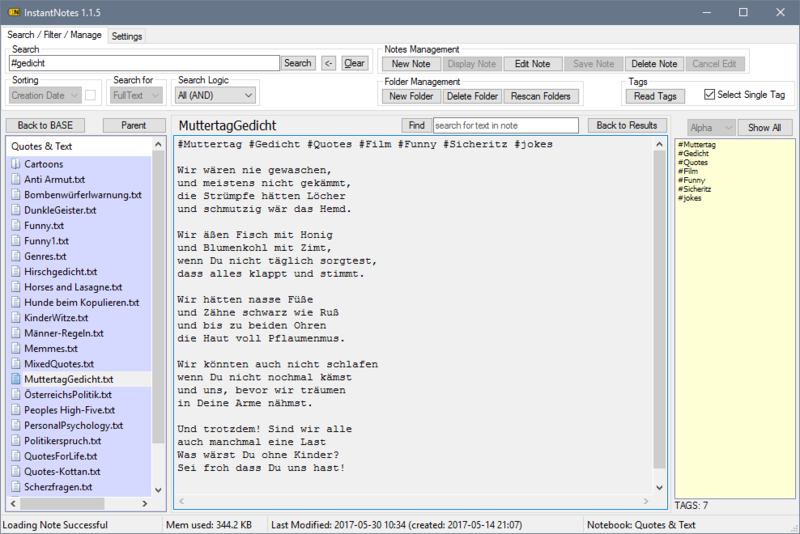 InstantNotes is a notetaking and information management software which uses local plain-text file as notes. The application helps managing local text files in folders, automatically extracts all #hashtags, hover-displays linked infos from the text and auto-syncs via Dropbox. InstantNotes features lightning fast full-text search with advanced search logics like AND/OR/Exact. Files can be searched for plaintext, #hashtags, folders, note-titles. Notes can be displayed in pop-up windows which can be saved in popup-groups for better research on your topics. Extended functions are image support, wiki-links, anchor-links, web-links and even files can be linked into a textfile and can be accessed with just one click on the link. Got a lot of plaintext files floating around on your computer? You use a mobile app which uses text files via dropbox? Want your text notes synced to other desktops or mobile? The Idea – The Solution! Many productive and creative people have a problem in common – they are chaotic. InstantNotes is an application that can not cure this behaviour, but it can at least help manage your personal text notes. Written stuff saved in plain-text files, floating around on your computers and are lost otherwise. InstantNotes stores them in one place, sorted in folders and tagged with #hashtags all in one base folder. With so many highly sophisticated notes/journey/jotter applications out there it was still hard to find an application (and corresponding mobile app) which suits the requirements for taking plain-text notes and managing them. Read: FINDING THEM FAST! Everybody. Everybody who takes text notes. Everybody who has a lot of text notes. Everybody who wants the notes on the local machine with the option to sync it to the cloud. Student Notes, Book Notes, Jokes Collections, Medical Notes, Personal Notes, Personal Diary, Work Notes, Shoping Lists, Computer Settings, TV Settings, Health Infos, Nutrition Infos, Cooking Recipes, quotes from books, quotes from people, jokes, short stories, as personal diary, as project diary, for remembering terms, for motivational text sniplets, personal top 10 lists, as more specific contact- or client book, for notes about projects or clients, all kinds of trivia, for technical information, to remember settings for devices like TVs, or program settings, travel information, travel diary, tips & tricks, lifehacker informations, gift ideas, health information, receipts, coctail receipts, wishlists, all kind of statistics, etc. etc. etc. The list could go on forever, basically InstantNotes can be used for any kind of text information. Just put all of your plaintext (.txt) files in it’s base folder and you will find your information. 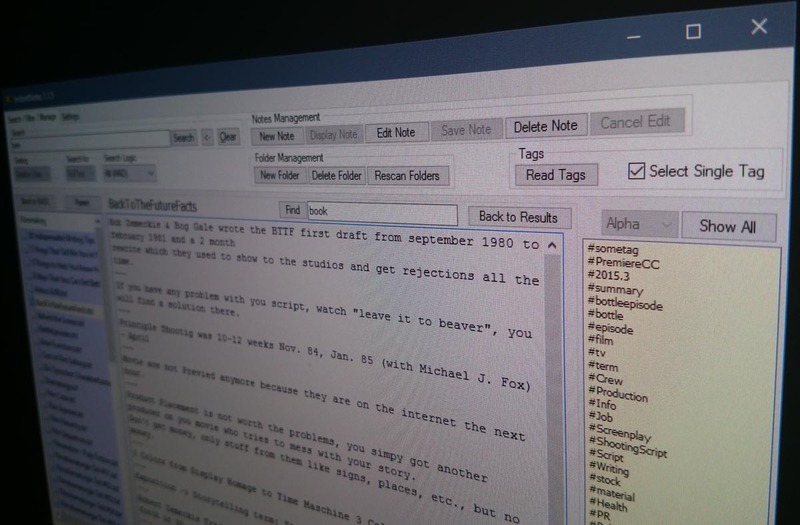 Expanded Features enhances your plain-text note files. All sorts of links are clickable: web-links, web-image-links. Even file links can be added and when clicked, the file is opened with it’s associated application. Link notes together with Wiki-Links so you can jump from note to note with a single click. Mouse-over functions: Images are shown in a popup if the mouse hovers over an web-image link or an local file image link. It’s like magic! 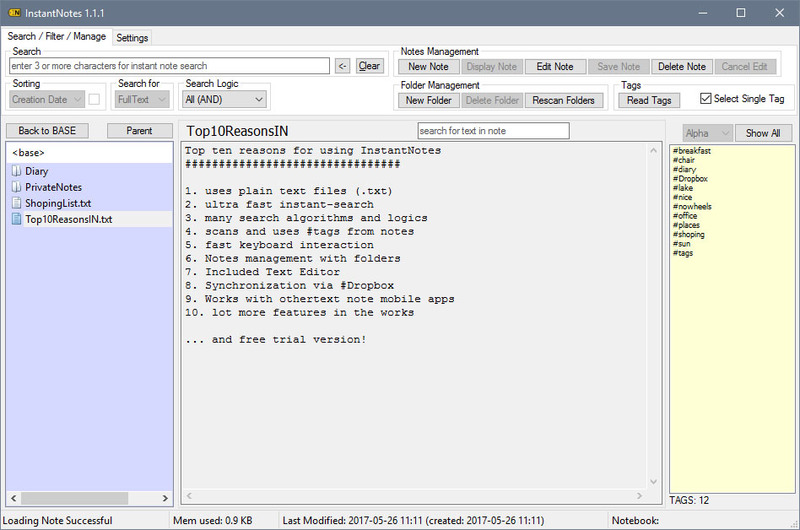 See InstantNotes as a text-editor with enhanced file manangement and text-search on stereoids. The main focus of the app is to find your infos in your text files fast in multiple ways to make it convenient for you to work with your text-note collection. You can create, write, save and delete notes and folders, like a usual file-manager would do. The search function is the heart of InstantNotes. You type your search term in the search input box and the application instantly start searching for the text and displays matching results in the result listview. You can search for simple text or use #hashtags you prevously used in your notes. The results in the list show the first few characters matching your search-terms. Doubleclicking an entry shows the note and can now be edited. When there is only one result, the resulting note is instantly opened without the need to click it, just by typing your search words in the input field – even without the need to press enter! Notes can be search via #hashtags and groups of popup notes can be defined for quick acces of most used text-file notes. 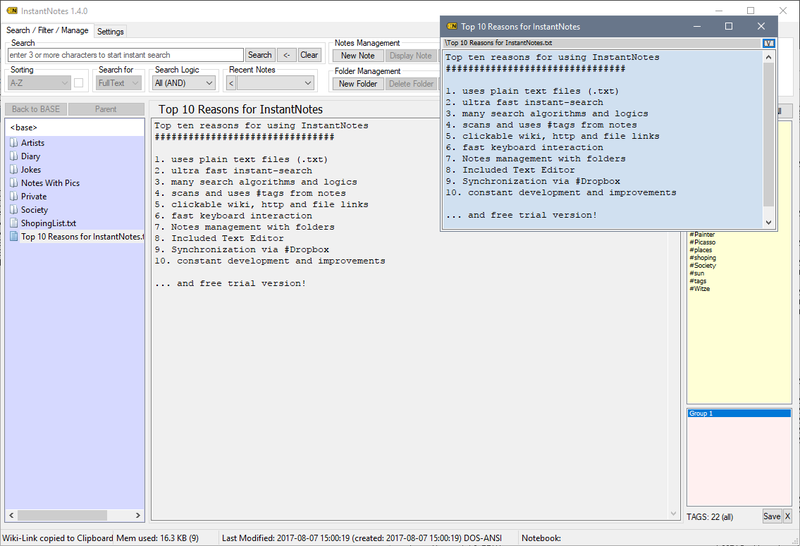 InstantNotes has a very small memory footprint but is very fast searching hundreds of notes in a fraction of a second. The application and the text-notes files can be located everywhere – on a Harddisk or USB Drive (as portable app), even on a network drive. Although it is recommended that the base folder containing the notes-files should be located on a fast local harddrive or SDD for best search performance. 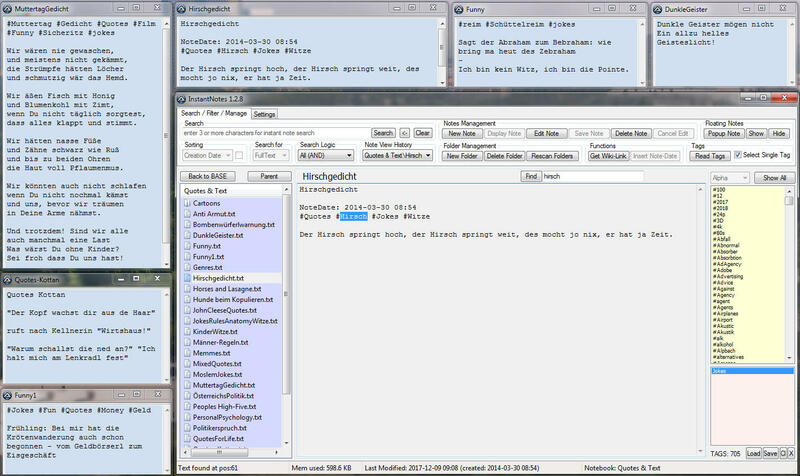 The base folder defined in InstantNotes containing all the plaintext files is generally on your desktop computer, on a local harddisk. But the folder can also be on a network drive, a network path. You can synchronize your files with your favorite file-sync tools like Dropbox and InstantNotes automatically checks for file changes if “AutoSync” is enabled via InstantNotes settings. If you use the app Notes for Android and have Dropbox installed on your desktop, InstantNotes finds the folder with the note files and sets it as the base-folder and activates synchronization. While InstantNotes can be used offline, Dropbox or any other file synchronization service can be used to synchronize the notes. InstantNotes check for file changes when synchronization is enabled via the app’s s settings. The Status bar at the bottom of the application windows displays currently used Notes-RAM, the creation- and modification-dates from the note and the currenty shown folder called “Notebook”. A Desktop application is only as good as it’s mobile counterpart. After searching and testing note taking apps for mobile and for the desktop for a long time I found “Notes for Android” as the perfect mobile app for plain-text-notes management. It seems so perfect that I just built my desktop app InstantNotes for it. It has nearly the same functions set and I added a few usefull informational convenience features to make it even more usefull as a productivity app. … and every other app that uses plaintext files and Dropbox to sync the files. Please be aware that not every app supports all features of InstantNotes and vice versa. The main-thing that these apps does have in common are the non-proprietary plain-text files which are accessable through any program which supports plain-text-files. What worth are your notes if you’re unable to find them, when you have to click a thousand times until a note is open. If you need your informations, you need them instantly. Nobody can remember everything, but you have to know where to search – and how to search. InstantNotes is here to help, to manage your thoughts, the simpliest and fastest way possible. If you have any feature request, please feel free and write them in the comments or leave me a mail at support@ntown.at, or take a look at our trello support board – maybe it’s a feature which is already in the pipeline. 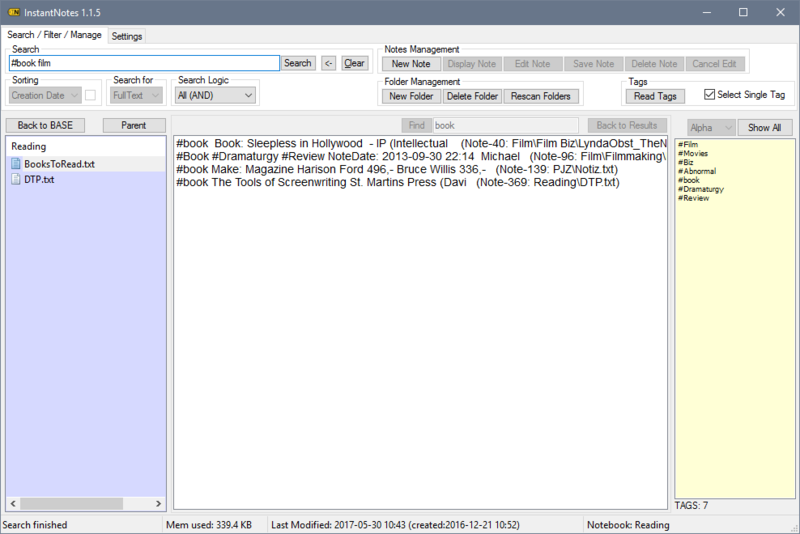 Even more convenience features to manage your text-files and find your infos quickly ! Missing some features or found a bug? Leave us a note! Don’t forget to check our Newsletter for special discounts. If InstantNotes finds a Dropbox installation it tries to find the notes folder from the Android App “Notes for Android” and uses it as base folder. 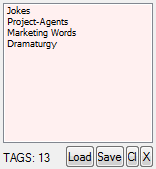 INFO: InstantNotes actually needs much less than the minimum requirements. The application itself needs only about 40MB RAM and less than 2MB disk space. Because plain-text files do not need much space, the application is very resource friendly and runs even on low powered machines. Please report bugs and ideas for features to support@ntown.at. InstantNotes can be run on any Intel-based Mac via WineBottler!